Photographed in the Temsco area of North Tongass. 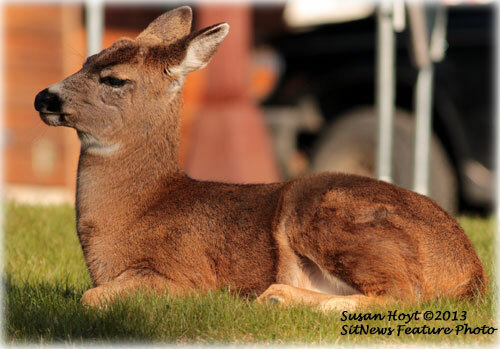 There were two eating grass and enjoying dandelions -- then this one layed down. Ketchikan: Ketchikan Health Activist Keynote Presenter at Native Wellness Conference - Ketchikan Indian Community member and health activist Clarita Seludo was one of the keynote presenters at the recent American Indian Institute Women & Men's Wellness Conference in San Diego, California. Pictured at the podium are Clarita Seludo (Tlingit, Raven Halibut Clan) of Ketchikan, AK; and Zolina Zizi (Cheyenne, Arikara, Creek), CA. 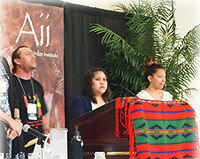 Ketchikan's Seludo and members of the 2012 PATHSTAR Alcatraz Swim Week joined health advocates from over 75 Native nations across the United States and Canada at the 12th Native Women & Men’s Wellness Conference held March 17-20. Zolina Zizi (Cheyenne, Arikara, Creek), California; Shelli Martinez and Joey Cohen (Colville Confederated Tribes), Washington; Clarita Seludo (Tlingit, Raven Halibut Clan), Ketchikan, Alaska ; and Wicahpiluta Calenderia (Rumsen Ohlone/Apache), California; joined PATHSTAR Director Nancy Iverson and swim week volunteer Suzanne Greva at the conference. Ketchikan: First Annual "Traditional Fall Gathering" Planned - Recently there has been a local effort to develop interest and participation in what is being referred to as an annual " TRADITIONAL FALL GATHERING" event in the Ketchikan area said James Llanos Sr, President of ANB Camp 14. According to Llanos, the organizing committee is looking at the proposed event being held during the month of November, preferably sometime during the first two weeks of the month on a Friday and Saturday. Llanos, speaking on behalf of the organizing committee, said this annual event would not duplicate the Sealaska Celebration event, but give Southern Southeast Native Communities an opportunity to come together in a Traditional Native Gathering as was done in years past. Llanos said the first event would be held at the Saxman Community Center. There were kickoff meetings, in March and April, and there will be another on Saturday April 27th, 2013 at 2pm at the Saxman City Hall (Red Building) to further discuss the project said Llanos. To date the Alaska Native Brotherhood and Alaska Native Sisterhood Camp 14 Ketchikan, KTKN Radio, and the City of Saxman appear to be the initial sponsors. All interested parties are welcome to help said Llanos. Ketchikan: New Family Medicine Doctor Joins PeaceHealth Ketchikan Medical Group - PeaceHealth Ketchikan Medical Center announced that Dr. Galen Whipple, MD has joined its Family and Internal Medicine Clinic. After attending the University of Minnesota Medical School, Dr. Whipple chose to complete his residency training through the Cascades East Rural Family Medicine Residency Program of Oregon Health and Science University. The program is a three year, community-based program that strives to prepare providers to become models of excellence in rural health care delivery. After receiving his doctorate, Dr. Whipple spent several years providing care to Emergency and Urgent Care patients in eastern Oregon and Sacramento. Because of his passion for caring for patients in rural areas, Dr. Whipple ultimately chose to return to family practice in Ketchikan. Ketchikan: Ketchikan Story Project Garners Six Telly Awards; Winning elements include videos, web site and kiosks - The Ketchikan Story Project brought home six 2013 Telly Awards last week - three silver and three bronze, announced Patti Mackey President & CEO of the Ketchikan Visitors Bureau. The Telly Awards “honor the very best local, regional, and cable television programs, the finest video and film productions, and work created for the Web.” According to the Telly Awards web site, of the 11,000+ entries received each year, only 7-10% are awarded with silver statuettes and up to 25% are awarded bronze awards. The Ketchikan Story Project is a multi media information program produced by the Ketchikan Visitors Bureau and funded by the Ketchikan Gateway Borough to provide information tools for the cruise industry and its passengers. The chapters receiving award were titled Ketchikan: Our Native Legacy and Ketchikan: The Artists. These chapters represent two of five segments of the project and were produced in 2012. Southeast Alaska: 2013 Timber Harvest Program Begins with Ceremony; Timber program provides benefits across the region and state – Sealaska’s annual First Tree Ceremony, similar to “Blessing of the Fleet,” was held to start the 2013 timber program. The event was held on Prince of Wales Island near Big Salt, just north of Klawock on April 13th. Sealaska’s timber program is dependent on finalizing acreage due under the Alaska Native Claims Settlement Act (ANCSA). Benefits from Sealaska’s timber program include jobs, community infrastructure, ANCSA Section 7(i) revenue sharing payments, scholarships and distributions to tribal member shareholders. Passage of this federal legislation is crucial to Sealaska’s goal of achieving economic sustainability in our communities.